If you’re looking to upgrade your ride to an e-bike, then you generally have two options: Either install a complicated retrofit kit, or ditch your analog bike altogether and buy a ready-made electric one. Wouldn’t it be nice if there were an easier option? Well, thanks to Austrian startup go-e, there finally is. Unlike most of other retrofittable e-bike kits out there right now, the ONwheel is designed to be installed in just a few minutes. Using just two screwdrivers, the device can be affixed to just about any bicycle. Once you’ve got the mounts on, the electric drive module can be clipped on or off in seconds. This unique clip-on motor system is made possible by ONwheel’s clever design. It’s basically like a scaled-up, repurposed version of the hot shoe on your DSLR, so you can clip on the drive unit in the same way you’d slide an external flash onto your camera. 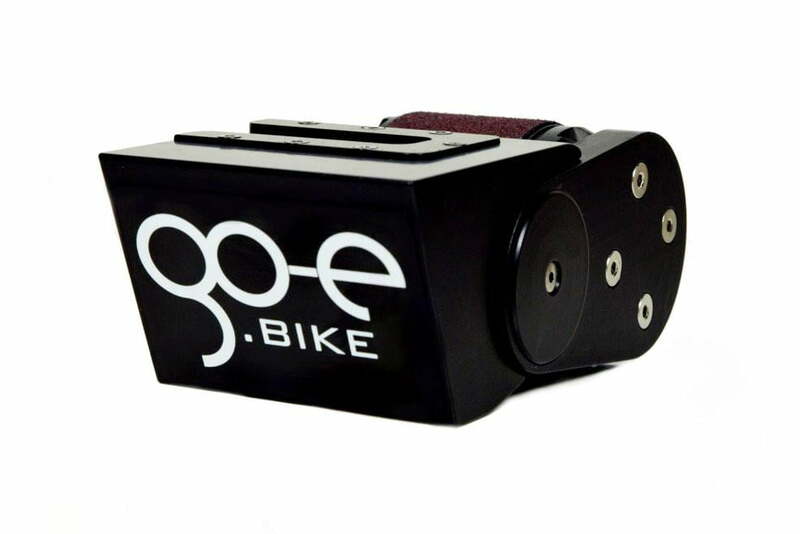 Once it’s there, it draws power from the rechargeable battery (which you mount inside your bike’s frame), and allows you to boost up hills or along straightaways. Despite looking a little rudimentary on the outside, the ONwheel drive unit is actually fairly sophisticated. The motor features clever swing-arm design that allows it to engage when you’re pedaling and disengage when you’re not, and users can adjust the level of pedal assist (from totally off all the way up to doing all the work) via buttons mounted on their handlebars. The motor is set to a default maximum speed of 25 kilometers per hour (15.5 mph) in order to meet EU regulations — but can be adjusted with the accompanying smartphone app to reach speeds as high as 45 kilometers per hour (28 mph). Range varies depending on the terrain you’re riding on and the power level you’re using, but according to ONwheel’s creators, cycling at a moderate power level should give you approximately 60 kilometers (37 miles) of battery range.